It’s one of the most popular colors on earth, a color that inspires tranquility and a sense of relief: blue. Blue has always been a popular color in homes for many years, but its use has changed. Blue decor or even appliances had their day in the past. Now, though, blue is one of the most popular paint colors. 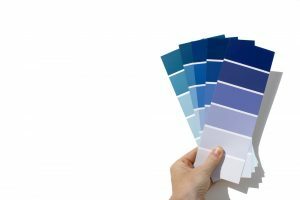 Ask a painting company in Atlanta today for a recommendation for virtually any room of your home, and they’ll likely recommend some shade of blue. As the stark, white minimalism of the early part of the 21st century declines, people are now starting to favor bold and artistic color choices, which means that everyone’s favorite shade of blue can make it onto their living room or bedroom walls. Here’s a guide to designing with blue wall paint. Behr, one of the most recognizable and relied-on brands of paint in the country, releases a “color of the year” near the start of every year, eyeing design trends and how their own products tend to sell. They recently crowned “Blueprint” 2019’s color of the year, so expect to see this cool, bold shade of blue with touches of green and gray in homes across America. House painting projects in 2019 will likely favor this smart, subdued take on turquoise, especially in living rooms and kitchens. The blue wall paint trend is sure to have an effect on how people entertain, relax, and go about their routines. After all, color has tremendous influence on the mind. Scientists have noted for years the ways in which shades of blue make you feel relaxed, comfortable, and even less anxious. The color culturally associated with depression or lethargy may actually do the opposite. It gives you a pleasant sense of calm, and in workspaces can inspire relaxed, creative expression. Scientists believe that cool colors like blue may relax you because of its association with water. Humans in the wild looked to sources of water for hydration and food. Wetter environments encourage dense plant growth and attract wildlife, so sheltering oneself near water was key to survival. From navy to steely blue-gray or even Blueprint by Behr, dark blues are excellent color choices for kitchens and living rooms. These shades pair well with electronics and appliances, and they add a handsome relaxation to these vital entertaining spaces. Welcome guests into dark blue rooms to make a dramatic impact and inspire calm. Rich and balanced, medium blues are great choices for bathrooms, dining rooms, and offices. Calm shades like denim will have an impact without giving these rooms a cramped feel. Save your darker shades for more expansive rooms, and let medium blues give smart sophistication to smaller ones. Paint your bedrooms light blue and you’ll sleep better than ever. 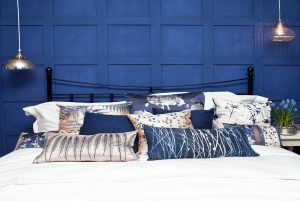 Dusty and slightly neutral, or softened with white and gray, blue is an excellent color for sleep. The subtlety and sense of calm will make every bedroom feel like a sanctuary. If you want to carry this relaxed vibe to other rooms, try painting your breakfast nook, hallways, and master bathroom light blue. House painting contractors even recommend light blue for home exterior walls for a welcoming and friendly personality. Give every room a much-needed color upgrade with the help of Fillo Painting Contractors. Professional interior painters in Atlanta will take care of the trouble of painting, with smoother, longer-lasting results.